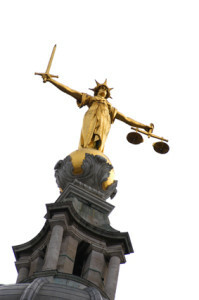 Statues of Lady Justice can be found around the world, this one atop London’s Old Bailey courthouse. So the government is the only organization or that has rights instead of privileges? Therefore the people that comprise the government are the only people who have rights, thereby establishing two distinct types of people. Orwell would be so proud. Brushing Aside the Rule of Law or just change the Law. Obama and G.W.Bush previously like to “change” the law and not break it. Judge Theodor Meron was successively a Polish, Israeli and then a U.S. citizen before becoming the president of the international bar association. He was legal adviser to the Israeli government and Israeli ambassador to Canada and the United Nations. He became President of the International Criminal Tribunal for the former Yugoslavia and Presiding Judge of the Appeals Chambers, International Criminal Tribunal for Rwanda. Recently under his Presidency and with pressure from Israel and the US changes were made to make it more difficult to hold war criminals responsible for their crimes. As a result the National Commission for the Fight against Genocide and, in Slovenia, the International Institute for Middle-East and Balkan Studies (IFIMES) demand the suspension of Judge Theodor Meron. The basis for law in a democracy is not the self-interest of politicians or Supreme Court moralists. The equality of each unique human levels the authority of any group to decide on the values of all. The arguments about Egypt coups based on Islamic or military beliefs is nonsense. Morsi was elected president of a democracy. Hitler was elected chancellor of the German Democratic Republic. Each fanatic believed he knew what was best for the people. Each immediately instituted policies through a coup d’Etat, the overthrow of the constitution to achieve political and religious control. Oh, yes, Naziism is as much a religion as Sharia law in the hands of extremists. The military are attempting a coup de grace, a finishing blow to an unconstitutional usurpation of a democracy. Perhaps we should be more concerned with the extreme conservative GOP insinuating its morality into the laws of state and national policy if we wish to return to a leadership role by example rather than delusion. Experience shapes the lens of perception and in my opinion, Pillar hasn’t enough distance from his career to present unbiased facts in his article, or simply he had not been paying close attention to events in Egypt these past few years. Known CIA front â€˜Freedom Houseâ€™ (ever since rogue CIA officer Phillip Agee, among others, had fingered the organization) and associated organizations such as the National Democratic Institute, had been training the leadership of the initial secular and student youth movement, with apple technology for revolutionary coordinating purposes. Meanwhile, the Mubarak regime had acquired all the necessary electronic snooping technology to analyze, identify and isolate the secular movementâ€™s leadership, they were rounded up and sent off to USA torture darling Omar Suliemanâ€™s jails. The Muslim Brotherhood stepped in and hijacked the revolution they had initially refused to support, together with taking over the new constitutional process, perfectly happy the secular movement had been marginalized for them. The Brotherhood now wrote the secular movement out of the â€˜democraticâ€™ process with a biased constitution and by speeding an election other interested parties had no time to regroup and properly prepare for. Morsi lacked the political maturity to include ‘pluralism’ in the emerging ‘democratic’ model, broke promise after promise relating to restraint and in the process, wrote inclusiveness out of the equation. Of course all of this is just dandy if you are fundamentalist. Without claiming the concept is at all original with me, I observe that we are living in the “Post-legal Era,” where laws are considered irrelevant nuisances to be brushed aside when they become inconvenient. And I include in that the organic law, the US Constitution. Kinda reminds me of Sam Ervin’s comment during the Watergate hearings: “You can call it an elephant, or you can call it a mouse with a glandular condition”. We’ve had a rational, respectable former U.S. President this week state that, “The United States is no longer a functional Democracy”, and nobody, at least not the mainstream media, has noticed. At the same time, we’ve heard presidential wannabee Hillary clinton say, “Citizenship is a privilege, not a right”. So much for the inalienability touted by those Founding Fathers our hypocrite politicians love to quote. We are told, “These are debates the country needs to have”, but the particulars are secret, so forget about the debate. The government can’t be sued, because the plaintiffs lack “standing”. Seems to me, there was a Supreme Court case many years ago in which someone was fired without being given a reason. The plaintiff maintained that, if the reason was secret, it was impossible to know if there had been a violation of civil rights. I believe the court ruled that the “secret” reason did, in fact, violate the individual’s civil rights. I guess they’ll be overturning that decision soon, as the use of “secret” stuff for prosecution of whistle-blowers is becoming the norm. Robert Blake’s “Beretta” character would say, “Don’t report the crime if you can’t do the time”. Or, perhaps Sergeant Schultz of “Hogan’s Heroes” fame would be more appropriate.